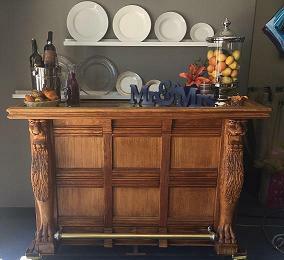 Ornate Bar mounted on casters for easy transport. Due to weight, ground level delivery only. Bar oringated in Scottsdale, AZ. * Please call us with any questions about our bar scottsdale w brass top rentals in Sedona, Cottonwood, Camp Verde, Prescott Valley, Chino Valley and surrounding metro areas.